You can run the software on Mac OS X, Windows, or Linux operating systems. ‣ Mac OS X: Double-click on the Harmony Stage icon or select Applications > Toon Boom Harmony 10.3 > Stage. 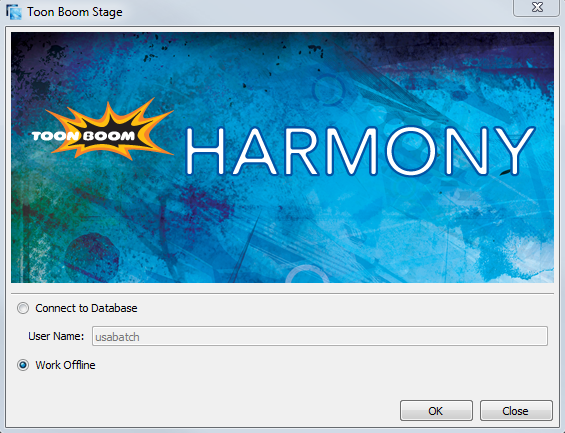 Enable this option to work on Harmony connected to the database. When you are connected to the database, you can access scenes stored in the central database of Toon Boom Server and exclusive options becomes available in the different menus. However, you will not be able to create new scenes directly from Harmony Stage and the available scenes will be the ones that were previously created using the Control Centre. The Work Offline mode is enabled by default when you launch Harmony for the first time. Using this mode let’s you create new scenes and work locally on your machine on independent projects as you would with any local software. - Options exclusive to the Harmony solution will not be available in the different menus. - You will not have access to any projects stored in the central database of Toon Boom Server. If you have a standalone license, Toon Boom Harmony will open directly with the Welcome Screen. 2. Enable either the Work Offline or the Connect to Database option. In Offline mode, the Welcome Screen opens—see Welcome Screen. In Database mode, the Database Selector opens—see Connecting to the Database.